A savory chili-seasoned rub flavors this slow cooker roast. Feel free to use a chuck arm roast, a bottom round, or rump roast in place of the tri-tip. Give this roast at least an hour in the marinade before cooking. The list of ingredients seems long, but most are spices you probably have in your pantry, and they add flavor to the dish. Avoid overcooking the tri-tip. It should still be sliceable when it's done. In a bowl combine the chili powder with the onion powder, chipotle powder (if using), 1/2 teaspoon of oregano, cumin, cayenne pepper, a dash of black pepper, 2 tablespoons of olive oil, and 2 teaspoons of Worcestershire sauce. Rub the tri-tip roast all over with the spice mixture. Put it in a food storage bag. Refrigerate and let the roast marinate for 1 hour or overnight. Put potatoes, onion, and carrots in a 6 to 7-quart slow cooker. Drizzle with 2 tablespoons of olive oil and add the parsley, rosemary, 1/2 teaspoon of oregano or basil, dill, 1 teaspoon salt, and 1/4 teaspoon pepper. Toss to coat thoroughly. 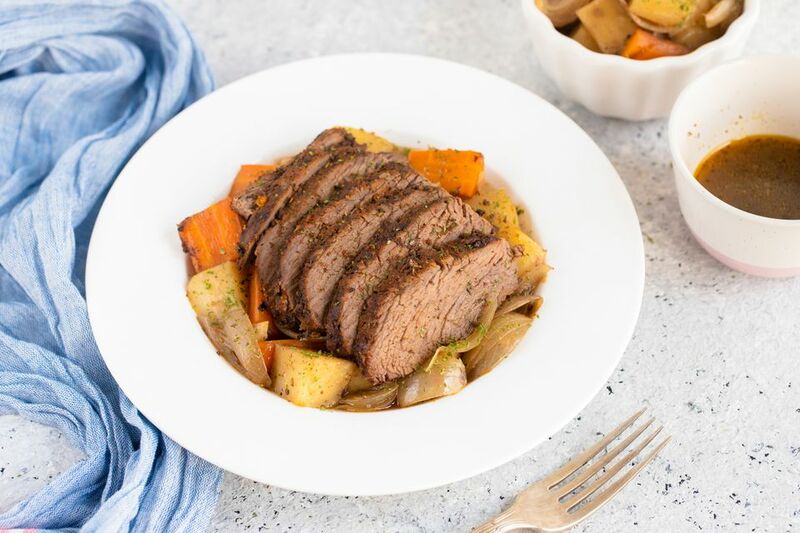 Place the tri-tip roast on the vegetables. Add 1/2 cup of beef stock. Cover and cook on low for 6 to 7 hours, or on high for about 3 hours. Move the meat to a cutting board and slice thinly. Serve the sliced meat with the vegetables and any of the braising liquids that have accumulated in the slow cooker. You can substitute the tri-tip with a​ pot roast cut. Just know that the dish might take a bit longer.